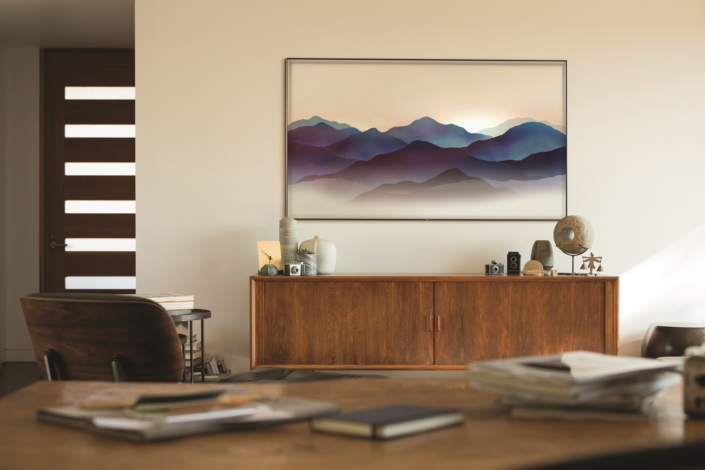 Samsung Electronics announced a partnership with Dezeen, a leading design and architectural magazine, inviting designers to create graphics for the Ambient Mode feature on Samsung’s QLED TVs. Held from June 25 to August 3, the contest will reward 29,500 euros in total prize money. To enter the contest, designers need to submit their best Ambient Mode designs using either static or animated images. Samsung’s Ambient Mode does away with the mundane black screen that dominates a room when the television is not in use. Built into the 2018 QLED televisions, Ambient Mode makes the screen appear transparent by mimicking the appearance of the wall behind it, while also enhancing its environment by overlaying additional imagery and information – such as the weather – if desired. To enter, contestants must pick one of the four backgrounds provided by Samsung and develop concepts that build on both the television’s environment and the time of day in which the feature would be utilized. Designers can base their entry on one of Samsung’s existing Ambient Modes – décor, information or personal photos – or they can propose a completely novel mode. Further, as Samsung and Dezeen are looking for concepts that highlight how Ambient Mode can mirror the environment and blend into the aesthetic of consumers’ homes, entrants will need to specify a particular lifestyle for their design. The competition’s judging panel includes esteemed designers Neville Brody and Erwan Bouroullec, as well as members of Samsung’s and Dezeen’s design teams – Dontae Lee, Executive Vice President and the Head of the Corporate Design Center at Samsung Electronics and Amy Frearson, editorial director of Dezeen. The competition will reward 29,500 euros in total prize money. The grand prize winner will receive 8,000 euros while two runners-up will receive 3,000 euros, respectively. 1,500 euros will be awarded to the other seven shortlisted entrants and 1,000 euros will be given to five longlisted designers. Dezeen will interview the finalists and publish a story about each of them. The competition entry is free of charge. However, entrants must be over 18 years of age with the ability to present their work to a panel of English-speaking judges. For more information on how to enter, please visit dezeen.com/Samsung. This is the second contest in which Samsung and Dezeen have partnered to organize. In 2017, the two companies cooperated to host a TV accessory design competition for Samsung QLED lineup’s TV stands and received a total of 1,200 works from 83 countries. The contest participant Fulden Denheli received a grand prize and later was also named the winner at IFA 2017 for her adaptable, Scandinavian-inspired concept.